Bruce Weber had quite a week, easily the richest in his life and possibly the most hectic. How many people can say they got to keep $3.9 million from their previous job (Illinois) and then were hired for a new gig (Kansas State) for $8.5 million over five years? Well, probably only a handful of coaches in sports and Hollywood actors, among a few select professions. "I had a good week last week," Weber said. Weber was fired last month from Illinois. He said he was shocked over the way the season ended. But the Illini had floundered down the stretch and a blowout loss at Nebraska in February seemed to spell doom. A season ago, he decided against pursuing openings at Oklahoma and Missouri. He wanted to stay as coach of the Illini and Meyers Leonard. His wife, Megan, didn't want to leave Champaign. Daughter Emily was finishing her freshman year at Illinois. But the season spiraled out of control after a strong start that included wins over Gonzaga and Ohio State. Illinois lost 12 of its last 14 games. "It was a tough time in my life," Weber said. "We coached our butts off but the team lost its spirit and lost its heart. They were still playing hard and trying. But we couldn't get over the hump. I thought if we won two games in the Big Ten tournament we would have had enough top-100 wins to get in the NCAA tournament. "Whatever happened with my job, I wanted the kids to have success and the opportunity. I stayed there because of my family and the freshmen and the younger guys. It was hard." But Weber was in a rare situation for a fired coach. He was a wanted commodity. He could have gone back to Southern Illinois, where he once coached. Instead, he waited to see if there would be other offers. Weber detailed his week Wednesday night for ESPN.com. Weber feared that he wouldn't get another job when the phone didn't ring. But suddenly, prior to the Final Four, there was interest. He had visited College of Charleston the week before and seriously considered the job. He has vacationed in South Carolina often. "I thought this might be the place I end up but then things changed," Weber said. "My wife said 'Are you ready to not be at the highest level? I know you. You spent 27 years in the Big Ten [at Purdue and Illinois] and I want you to be happy and if you are go for it.' And then this came up." It was kind of amazing. I went to New Orleans not expecting to be in Manhattan, Kansas [on Saturday]. It started last Monday and went into Tuesday. Weber was setting up a number of interviews. But then he heard that Kansas State coach Frank Martin was going to South Carolina and Weber could be a dark horse candidate for the Wildcats' job. He was on the phone for eight or nine hours last Tuesday while his home in Champaign was prepped for a prospective buyer. "Then all of a sudden, I was asked if I could meet with Kansas State in Chicago on Wednesday [before the Final Four]," Weber said. He was supposed to meet for one hour, but it lasted three. He returned home and pulled an all-nighter to get ready for a home inspection at 8 a.m. Thursday. He had to find a place for his dog during the day. And he had a flight to catch for New Orleans, where he had three or four more interviews for other jobs. Kansas State asked him to meet on Friday, but it turned into another three-hour interview. Later on Friday, K-State president Kirk Schulz traveled to New Orleans to meet with Weber, along with athletic director John Currie. They met again later in the evening. "And then after 11 p.m. or midnight, they offered me the job and asked if I could be a on a plane at 8 a.m. to pick up my wife [in Champaign] for a press conference at 3 p.m. [in Manhattan, Kan.]," Weber said. "It was kind of amazing. I went to New Orleans not expecting to be in Manhattan, Kansas [on Saturday]." Weber met with the Kansas State players prior to the news conference. The first player he met with was Rodney McGruder. Weber wanted to make sure that the junior guard was on board. He went to a reception with boosters Saturday night. By Sunday morning he was at a church in Manhattan for mass and then went out with a real estate agent. Weber followed that with individual meetings with each returning Kansas State player, a must considering this Wildcats team has the core returning after losing to Syracuse in the third round of the NCAA tournament. Weber then headed back to Champaign on a private plane for Emily's cheerleading banquet. He packed up enough clothes and returned Monday morning to Manhattan for workouts with the players. Since Monday, he has worked out the team three times. "It's been so positive," Weber said. "Everyone has been really receptive. I know they could be wary about the new guy and what he's about, but they've been pretty good." Weber offered at least one assistant position to a member of Martin's staff but was turned down. He hired former SIU head coach and his former assistant Chris Lowery. He said he will likely mix in some members of his former Illinois staff, but is waiting for answers including from top assistant Jay Price. But he needs to know sooner than later so he can move in another direction if need be. Weber said he will hire an assistant with different recruiting contacts, notably Texas ties. But so far, less than a week on the job, he is convinced that no one is leaving from the team. "I would tell you that I feel that everybody is going to stay," Weber said. "McGruder has been the best. I got ahold of him before I took the job ... to see how he would feel about things. He was very positive and that was a good step in making my decision." Weber said that chatter over Will Spradling leaving is unfounded. "Frank was great here, there was a great culture here," Weber said. "I figured when I got to Illinois I had to win the players over [that were recruited by Bill Self]. That's what I'm attacking now. I'm making sure the players are happy and if they're happy the fans will come." Lowery reached out to Martin. Weber will soon. He will also seek out former Kansas State assistant Brad Underwood. "We've got good athletes, a point guard, McGruder, we just need to mix in a few guys," Weber said. "It's a good group. They can't score or had trouble doing so during the year." McGruder hasn't worked out yet with Weber due to stress fracture surgery on his foot. But he'll be back soon. Weber is looking for a transfer to fill out the recruiting class. "Frank did really good things, so did [ex-Kansas State coach Bob Huggins]," Weber said. "I'm replacing a coach that was well liked and did good things. We've got to continue what he's done. That's the biggest thing." Bruce Weber might have been out at Illinois no matter how the Illini's season ended. Mike Thomas is clearly looking to get his own coach, as is often the case when a new athletic director takes over at a school. There was no shortage of mistakes made at Illinois this season and everyone is at fault. Thomas didn't help the situation by declining to back Weber during a radio interview, essentially sealing Weber's fate in the middle of the Big Ten season. The Illini were in the midst of a three-game losing streak when that dreaded no-confidence vote was rendered; they would go on to lose their next three after it. Weber's reaction at the time was honest but he could not mask his frustration, providing what turned out to be prophetic insight into his coaching fate. The dysfunction isn't consigned to this Illinois team. Indeed, it dates to previous seasons. The recruitment of Jereme Richmond, heralded at the time, ended up being a complete bust after one year. Demetri McCamey and Weber had their issues at times. But none of this is to say Weber did not recruit well, at least initially. Criticism of Weber for missing out on Chicago recruits such as Derrick Rose or Anthony Davis is garbage. Illinois, no matter who was coaching, wasn't going to beat John Calipari and his recruiting connections for Rose (Memphis) or Davis (Kentucky). Eric Gordon was set to go to Illinois before Kelvin Sampson pried him away and persuaded the Indianapolis player to stay in his home state. Brandon Paul and Meyers Leonard were coveted players and remain great gets for the Illini. Weber should have gone to Oklahoma last year when he had the chance. Herb Sendek had the right idea when he left NC State right before he was about to be tossed and went to Arizona State. Weber will be high on the list to take the Southern Illinois head coaching vacancy, where he once coached, and replace his former assistant, Chris Lowery. It's one option, at least. Weber didn't forget how to be a head coach; he just needs a fresh start. Thomas will go after VCU's Shaka Smart, who grew up in the Midwest, to replace Weber. Smart won't say anything while coaching the Rams in the NCAA tournament. He signed a new 10-year deal last spring after VCU's Final Four run. He could pull a Brad Stevens (Butler) or Mark Few (Gonzaga) and stay put where he's comfortable. But Illinois is one of the best jobs in the country because of the conference, the proximity to Chicago-area talent and the fan base (though the facilities could use a serious upgrade). Smart would infuse energy into the program and would certainly be a hit in Chicago and around the Midwest. But let's not go overboard on the idea that whoever is the coach at Illinois is suddenly going to change the recruiting culture. Programs such as Kentucky, North Carolina and Duke are always likely to be the top choices among elite players. That is life. If, for some reason, Smart weren't the choice, then expect plenty of others to clamor for this gig. Washington's Lorenzo Romar, who coached at Saint Louis, has maxed out at his alma mater and could be looking for a new challenge. Oregon State's Craig Robinson is a Chicago native and former Northwestern assistant. His starting point guard, Ahmad Starks, is from Chicago. Duke associate head coach Chris Collins, who played at Glenbrook North High in Illinois, is also on a possible short list, although he would likely make more sense for Northwestern if that job comes open. Maybe Weber had a chance to salvage his job had Illinois made the NCAA tournament. Thomas didn't help him. The staff and players never rallied. The team didn't quit, but the dysfunction, especially down the stretch, was evident. Reaching the Final Four, as Weber did in 2005, isn't like a Supreme Court appointment. It can buy you time, but not a lifetime appointment. Georgia Tech fired Paul Hewitt. Illinois fired Weber. UCLA may do the same to Ben Howland in the near future. When it happens, there is plenty of blame to go around, not just for coaches, but for officials in the athletic department, the staff and players. The job is still a good one and the program will continue to survive and thrive. The divorce will ultimately be good for both parties. But like most, it got messy on its way to a final parting. The Illinois players need to forget about the coaching staff's fate and realize they can still go to the NCAA tournament. Coach Bruce Weber is likely out at season's end. No one has actually told Weber this yet, but according to those close to him, he wouldn't be surprised if it happens. He won't say it publicly and he shouldn't until the season is over. There have been enough public missteps recently. Weber will get his $3.9 million buyout and decide what he'll do next. He's as genuine a coach as the sport has seen in some time. He could end up helping his good friend Chris Lowery at Southern Illinois (if Lowery is still employed), or could be a hot commodity for a school like SIU. Weber didn't suddenly forget how to be a head coach. But the rest of this season isn't about him. He made his mistakes with this team, just like everyone else in the program should take ownership of the current slide. Weber had a chance to not be in this situation because he could have pushed for either the Oklahoma or Missouri openings last offseason. He had a chance at both. But he stayed loyal to Illinois. His family didn't want to leave Champaign, either, considering that one of his daughters is a cheerleader with the Illini. Weber could have made a play for Oregon the previous year, too, when that job went to Creighton's Dana Altman. Weber stayed too long. He knows it. And it will ultimately be his undoing at Illinois. According to multiple sources, he hasn't met with relatively new athletic director Mike Thomas lately. Thomas, according to sources, hasn't been micromanaging with any of the basketball coaches as he had to take care of a football program, firing/hiring a new coach there. If Weber is done, the speculation will be intense when the season is over as to whether VCU's Shaka Smart will be the first and only choice for this job. Thomas and Smart have a pre-existing relationship, and if Smart were to look to advance his career, this is a no-question move. If Smart went to Illinois, Chicago could end up being a pipeline to Champaign for talent. All of that speculation is for when the season is over. How the final three games and the Big Ten tournament go is up to the players. Guys like Meyers Leonard and Brandon Paul can decide if they want to play in the NCAA tournament. This is up to them. The fate of the coaching staff is no longer an excuse. Beating Iowa and Michigan at home is more than doable. Wisconsin is hardly a team that is a lock at home this season after losing multiple games at the Kohl Center. Playing the what-if game with Illinois isn't too difficult. If the Illini were to win these games, or at the very least two of the three, then the résumé would be enhanced since wins over Gonzaga, Michigan State and Ohio State are already in place. Of course, losing nine of the past 10 games is hardly a ringing endorsement for a bid. And the way the second half played out at Nebraska didn't pass anyone's eye test. But the season shouldn't be toast. Playing in the NCAA tournament can be a once-in-a-career situation for some of these players going forward. Who knows what will happen next season. Why not try to do something now? There is no reason why this team should quit or take a pass on the rest of the season. They can't save the coaching staff. It's over. So go and play for yourselves, for the pride in your school and try to end your season on a high. If the players continue the nosedive, then at this juncture they will have no one to blame but themselves. The staff will continue to coach, even though the end is near. If the players want to have enjoyable memories from this season, they can still make them, beginning Sunday against a suddenly surging Iowa and then next week against Michigan and at Wisconsin. It's up to them, not the staff. Sometimes we fault coaches for not saying enough. Sometimes we fault coaches for saying too much. Illinois coach Bruce Weber was emotional after a loss to Purdue on Wednesday. It was a game that the Illini should have won, but didn't, and the breakdowns could be attributed to the coaching staff and the execution of the players. It was a team loss. Weber unloaded during the news conference, as though the media members in front of him were his therapist. But there was no confidentiality in the room; every word was public record. He called out his own players and put plenty of blame on himself, saying he has coached not to lose all year. He apologized for his comments Thursday. He reiterated his desire to remain at Illinois in a press conference Friday. If any coach on the hot seat has reason to be defensive about his job, it's Weber. He was within minutes of a national championship in 2005. And don't start with the "he didn't recruit the players, Bill Self did." That argument holds no water when it comes to the accomplishments of that particular season, just like a similar argument does not hold for Frank Haith at Missouri this season. It's fair game to criticize Weber's program for its recruiting misses and disciplinary problems, as well as the Illini's erratic play in the Big Ten. But Weber has won multiple Big Ten titles, hasn't had academic issues and is widely regarded as a genuine, decent, humble man. It's a shame that his tenure at Illinois has come to this, since he's someone that has been good for the game. If this does end up being his final season with the Illini, he would be a perfect fit for a school in a conference like the Missouri Valley, where he coached at Southern Illinois before arriving at Illinois. He has consistently worn his emotions on his sleeve for all the world to see. He has made mistakes on the recruiting trail, including a glaring one in bringing Jereme Richmond to Champaign. He had Eric Gordon before Kelvin Sampson scooped him up and kept the Indiana native in Bloomington. He thought he had a shot with Chicago native Derrick Rose, though that seemed unlikely. Many coaches have tried to figure out how to successfully recruit Chicago. Many more have failed than flourished. Weber noted that he has turned down three jobs in the past two years due to the loyalty he has to Illinois. I spoke with him last offseason about one of those jobs and he simply didn't want to leave Illinois. He said the Illini could be special in the next two years with recruiting trending in their favor. In hindsight, that was probably a mistake, since a change in administration was coming -- Ron Guenther was out as athletic director and Mike Thomas was in. It's never a good sign for a coach experiencing a rough patch to have a new boss inserted into the equation. Thomas was noncommittal when asked to give Weber a vote of confidence recently. Which means he could be mustering up a reported $3.9 million buyout for Weber. That's a tough figure for a state school in these trying economic times, especially one that's already hired a new football coach. And even if Illinois were to pay that price, it would still have to pay a considerable amount to lure potential replacements such as VCU's Shaka Smart, Butler's Brad Stevens or even Duke associate coach Chris Collins. The best-case scenario for all parties would be if Weber found another gig and left Illinois of his own volition, giving himself and the program a fresh start. There's a feeling of uncertainty now, and it's there for everyone to see. The questions will only intensify if the Illini continue to sputter down the stretch; they've lost four games in a row and play three of their remaining five on the road, including at Ohio State and Wisconsin. Of course, there's always that chance of a run to the NCAA tournament. The opportunities are ahead of Illinois in the next three weeks, and this team can surprise people if there is uniformity on how to execute. The staff is focused on getting a bid and the players deserve their full attention. All is not lost, for this season at least. There will be time to assess the staff and the roster after the season and that should be done as soon as Illinois' season is over. But that time is not now. The staff hasn't quit; the administration shouldn't relinquish its support, either. If the players are still buying into the coaching and the team's goals, then at least the rest of this season can be salvaged. What happens next should be discussed in late March. 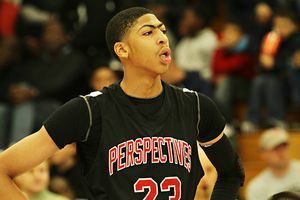 • Kentucky freshman Anthony Davis should be the new front-runner for national player of the year. Kansas' Thomas Robinson deserves all the adulation he has received for what he has done to this point in his career and this season for the Jayhawks. But no player changes the game the way Davis has in the SEC this season. He should be the SEC player of the year and at the very least a runner-up if he's not the choice for national player of the year. Kentucky coach John Calipari said Monday, "He changes the game for everybody, for our team, for everybody. He does it without changing his demeanor. He doesn't have a selfish bone in his body. That's what makes him the most valuable player out there." • When asked about Illinois coach Bruce Weber's job security, Illini athletic director Mike Thomas gave the standard response about evaluating the entire program, like he would for all 18 sports, at the end of the season. That doesn't necessarily sound like he's backing Weber. One source close to the situation said Weber has had a good relationship with Thomas and that Thomas hasn't given him any indication that he's out. Know this: Weber is a genuinely nice man. He attempts to do everything the right way. He coached the 2005 Illinois team exceptionally well and was within five minutes of a national title in St. Louis. The program has been on and off the bubble ever since, it seems. The best-case scenario at some point may be if Weber moved on, on his own, for a fresh start. Regardless of what occurs in 2012-13, the Illini have enough talent to be an elite Big Ten team next season. That's of course if Meyers Leonard decides to stay put. • Staying too long in one place isn't a false theory. That's why some coaches may regret not jumping when they had the chance. Weber may be one of them. Jim Baron at Rhode Island could be another. • I won't be surprised if Northwestern's Bill Carmody leaves even if the Wildcats make the NCAA tournament for the first time ever. Carmody has put every ounce of his sweat into trying to get this program into the tournament. He constantly looks like the weight of the world is on his shoulders. If he doesn't make the tournament, there's nothing wrong with knowing he gave it everything he had and the program never quite got over the hump. The Wildcats have to win a few key upcoming home games to try to influence the committee that they are worthy. Of course, if Carmody were to finally break through and make the NCAAs, the recruiting may go to another level and he would have to stay. But at Northwestern, just making the tournament would qualify as enough for him to move on. • The BracketBuster games looked tantalizing good a few weeks ago. But losses by Nevada, Iona, Creighton, Murray State and Saint Mary's have lowered the interest/importance a tad. The hottest teams since the matchups were announced are Long Beach State, Wichita State, Drexel and VCU. If you could reseed and have those four teams play in some form, that would still provide plenty of pop. Long Beach State is at Creighton, Wichita at Davidson, Drexel at Cleveland State and VCU hosts Northern Iowa. The Saint Mary's-Murray State game still has enormous value for the Racers. A win and everyone will settle down a bit about the Racers' at-large hopes. A loss and suddenly they are tossed back into the pool. The expectations for these teams to run the table from the moment the matchups are announced is simply an unfair expectation. • I don't think I've ever picked a team in November to make the Final Four and then not have that squad even make the NCAA tournament. Xavier could be the first. • There is a strong chance multiple teams from power six conferences will have double-digit conference wins and not get bids. This is the repercussion of having unbalanced schedules. Two teams to watch for this are South Florida and NC State. The coaches know they can't complain about winning 10 games in the Big East or ACC if they didn't beat any of the top four teams in the conference. • Valparaiso coach Bryce Drew won't win national coach of the year. 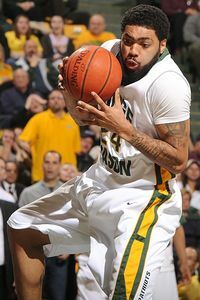 But he better win the Horizon League honor. I saw this team in an exhibition game in November. There was no reason to suspect the Crusaders would be leading the Horizon and on their way to a possible NCAA tournament berth. If you had to take which Drew brother would be in first place on Feb. 13 in his respective conference, it wouldn't have been close. Scott Drew of Baylor would have been the choice. • San Diego State's new rival in the Big West in 2013 will be Long Beach State. But the games simply won't feel as grand as when the Aztecs play UNLV. Everyone squawks about Missouri and Kansas playing in the future. Well, SDSU and UNLV should continue their series, as well. It's regional, easy travel and both programs are going to stay at a high level for the near future. • Murray State has tremendous respect among the coaches to only fall seven spots to No. 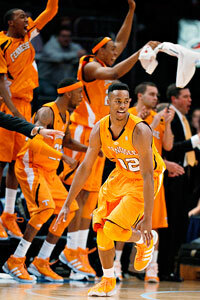 14 in the ESPN/USA Today poll after losing at home to Tennessee State. But what about Wichita State? The Shockers got no respect from the coaches after rocking Creighton in Omaha and establishing themselves as the premier team in the Valley. Wichita wasn't in the Top 25 released Monday. • I don't know which way I would lean for the national coach of the year award. The candidate list is quite long with Kentucky's John Calipari, Syracuse's Jim Boeheim, Missouri's Frank Haith, Kansas' Bill Self, Georgetown's John Thompson III, Notre Dame's Mike Brey, UNLV's Dave Rice, San Diego State's Steve Fisher, Saint Mary's Randy Bennett, Murray State's Steve Prohm and Michigan State's Tom Izzo. • The speculation about whether 6-foot-10 Andre Drummond, the No. 1 player in 2012 (currently at St. Thomas More School in Middletown, Conn.), could end up playing in the fall at UConn is over. It's not happening. According to Drummond's representatives, including his mother, he will not be in college this fall but will instead go for a post-graduate year. That plan is St. Thomas More for now. There had been plenty of chatter about the possibility that Drummond could be ready for the Huskies in the fall, but that point is moot. He hasn't committed to UConn, either. He's a serious player for Kentucky, North Carolina and Florida. And according to ESPN's recruiting site, he's still considering Pitt, Georgetown and Duke. Drummond will likely be shadowed by the aforementioned schools' head coaches at various stops in July. He'll be in Indianapolis on July 6-9; in New England at various events, including Springfield on July 10-18; in Las Vegas July 22-26 and Orlando on July 27-Aug. 1. • As a preseason top-25 team, Cincinnati's nonconference schedule is certainly worthy of criticism. But coach Mick Cronin makes a good point in the difficulties of getting into the elite tournaments as a Big East team. Tournaments are not allowed to take two teams from a conference, and a team can return to a tournament on a four-year cycle. That makes it very tough for a team like Cincinnati, which doesn't have as high a profile, to move ahead of teams such as Connecticut, Syracuse, Georgetown and Villanova for some of the elite tournaments. Pitt has chosen to stay away from the neutral-site events of late, so that takes the Panthers out of the mix for a Maui or Orlando event. That's why Cronin elected for a makeshift, multi-team event. He landed Marshall as a partner, and the Thundering Herd will be a viable contender for second behind Memphis in Conference USA. Still, the schedule, which includes Xavier (an annual series), at Georgia, Oklahoma and Marshall, could have used at least one more given top-25 team. Xavier is the only squad on this list that the Bearcats can comfortably say will be an NCAA tournament team -- as of now. • Bruce Weber is in a no-win situation at times at Illinois. He lands an elite player such as Jereme Richmond, and it's a big deal. And then the player ends up failing to have a major impact and bolts for the NBA draft, only to go undrafted and have a relative spout out about how he was wronged. I won't be surprised at some point if Weber pulls a Herb Sendek and takes another gig to restart the career. • John Calipari's contract with Kentucky is another indicator that we've entered a new era when the Wildcats will continue to be in step with any other elite school for the top recruits. I just don't see that ending anytime soon. • Dayton was tabbed as the site for the First Four in 2012 and 2013. The NCAA men's basketball selection committee is spending the week in Utah also discussing the issues that arose from the First Four. Clemson shouldn't have been forced to go from Dayton to Tampa inMarch and play an early game. If a team has to travel to a different part of the country, then there must be consideration given for the start time of the game. • The NCAA should look into other venues, though, such as the Palestra. • The NCAA is selling that VCU went to the Final Four through Dayton's First Four. If it continues, then we've entered a new era in the tournament. • Butler assistant Matt Graves lost out to BC assistant Joe Jones for the Boston University job. This confirms former Butler assistant Micah Shrewsberry's claim that it's hard to become a head coach as an assistant out of a Horizon League-like conference, including Butler. Jones was down the road as a head coach at Columbia. Obviously I wasn't in the interviewing process, but it's hard to compare that with the recent success of Butler, which is coming off consecutive national championship game appearances. Well, there is no comparison. • The NCAA will do the right thing in allowing Michigan to help Austin Hatch in any way it can during this horrific tragedy. Hatch is struggling for his life after going through the second plane crash in his young life. Hatch recently committed to the Wolverines for the 2013 season. • It will be interesting to see how USA U19 handles being blitzed by Lithuania's U20 team in an exhibition game 101-72 on Sunday in Panevezys, Lithuania. Michigan's Tim Hardaway Jr. came off the bench to score 18 points for the Americans. Butler's Khyle Marshall didn't make a field goal (0-for-7). This tournament will be critical for Marshall, UConn's Jeremy Lamb and Michigan State's Keith Appling to prove they can shoulder more responsibility. Lamb was 2-of-6, and Appling missed his only two shot attempts. Memphis' Joe Jackson did have a highlight dunk toward the end of this clip. Jackson scored 13 points and was 5-of-13 from the floor.